Seth MacFarlane nearly killed the comedy genre with his recent abomination A Million Ways to Die in the West. The concept of laughing was on life support. Phil Lord and Chris Miller found the cure. What a treat it is to absorb joyous, clever comedic writing and a wonderful testament to imaginative filmmaking. 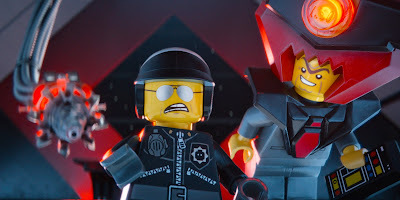 I never anticipated finding so much to love in The LEGO Movie because I underestimated the minds behind the film. I certainly never anticipated having tears in my eyes after a shockingly touching third act twist was revealed. My third viewing of this wonderful film, this time from the comfort of my couch after picking up the Blu-ray today, and I admire it even more now than I did the night I saw it at the cinema. It's one thing to simply make people laugh or throw some exciting visuals on the screen, but what is most impressive to me is the films ability to appeal to absolutely anyone willing to give it a chance. I know people whose ages range from 6 to 60 that all walked out of the theater and couldn't wait to see it again. I have seen people refer to The LEGO Movie as "stupid fun", and while it is practically the prototype for fun, please don't ever call it stupid. To achieve what Lord and Miller did here, it isn't just smart, it's friggin' brilliant.